The final was curved by adding 3 points to your total score. The grade points in the table above are computed after curving. Histograms of the final exam are available in the table below. Please send me questions by email (gboynton@u.washington.edu) or make an appointment for office hours if you have any questions about the material. Good luck on the Final! March 13: I've updated the Final Exam Study Guide (Chapters 12-15) to cover only the topics you're responsible for. March 9: Download the ScienceNews article on Sensory Substitution with the Tongue here. March 9: Download the NewYorker article Numbers Guy here. March 9: Download the NewYorker article Scents and Sensibility here. March 8: Exam 3 scores are in. As you guessed, the grades are lower than exams 1 and 2, so I'll compensate for this by adding 4 points to your score on Exam 3. Your grades for all the exams, and the average of the best 2 exams can be downloaded here. 4x30/42 = 2.86, 4x36/41 = 3.51, 4x34/45 = 3.02. Now, take the best two grade points (exams 2 and 3) and average them: (3.51+3.02)/2 = 3.27. That's your grade point for your exams, and will consist of 60% of your grade for the class. February 26: Download the Motion Induced Blindness movie here. February 18: EXAM 3 will be moved LATER to Monday, March 3rd. Because of the late notice, I can be more flexible about providing make-up exams for those who can't make it to class on this day. January 30: One copy of textbook is now available on reserve at the library. January 6: For those students wishing to add this class: The course is currently full, and I have been asked not to overload this class before the beginning of the quarter. I have compiled a waiting list based on the order in which students have contacted me. If you would like to be added to this list, please send me an email (gboynton@u.washington.edu). Mondays: 1:30-3:30 or by appt. As brain functions go, most of us think of sensation and perception as the easy part. We see, feel hear, touch and smell effortlessly, while other brain functions like language and memory seem much more difficult and prone to disorders. But the fact that sensory processing seem so easy is what makes it so amazing. It may seem easy to you, but did you know that about half of your brain is devoted to sensory perception? Perhaps perception seems so easy because we have so much 'neural hardware' devoted to it. Our senses aren't prefect, however. Look at the image above. 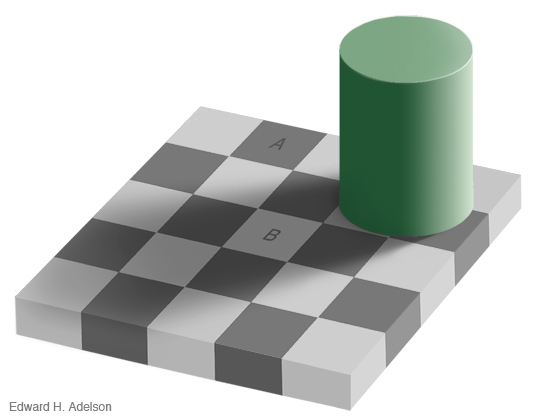 Would you believe that the two checkers marked 'A' and 'B' are actually the same? What's going on here? In this class we'll learn about how illusions like the one above teach that the brain is simply doing it's best to make sense of the incoming sensory information - and it can easily be fooled. We'll learn how the latest technology allows us to measure the brain's responses to various sensory stimuli, and how conscious effort and experience can affect these responses. 1. Students will broaden, deepen and reinforce the basic working knowledge about the structure and function of the nervous system acquired in Psych 202. 2. Students will develop a basic working knowledge of classical psychophysics. 3. Students will develop a basic working knowledge about the structure and function of the gustatory system, olfactory system, somatosensory system, visual system, and auditory system. 4. Students will develop an understanding of the relation between biological systems, neural processing mechanisms, and perception. This will include understanding the how biological factors influence aspects of human perception that are shared across, or may differ across, cultural, ethnic, gender, geographic, or other boundaries. 5. Students will develop an appreciation of properties common to all sensory systems, and properties shared by sensory systems and other brain systems. 6. Students will develop an understanding of the study of sensory systems and processes within the historical context of the field, and potential future directions of the field. This includes understanding the tentative nature of knowledge, tolerating ambiguity, and using skeptical inquiry to discover discrepancies and/or gaps in current knowledge. 7. Students will develop and refine their ability to critically read and understand scientific literature, understand and use scientific and technical vocabulary, and synthesize information from multiple sources. The course will cover the first 16 chapters from Sensation and Perception (7th edition) by E. Bruce Goldstein. Lecture material will generally follow the textbook, but there will be material in the book that's not in the lectures, and vice versa. There will be three mid-term exams, a cumulative final. Exams will cover material from the book, lectures, and quiz sections. I will drop the lowest of the three midterm exam grades so that only your best two midterm exam scores and the final exam will count toward your final grade. Your best two midterm exams will count toward 30% of your final grade, and the final is worth 40% of your final grade. quiz sections before each exam will serve as review sessions. Material presented during these sections may show up on the exams, so attendance is strongly encouraged. 1. Attendance at all lectures is expected. You will be held responsible for all announcements made during class meetings regarding exam scheduling and assignment due dates. I will post announcements to this course website, but, in general, you’ll get the information soonest if you are in class. 2. If you miss an exam, you will be given a grade of 0 for that exam. No makeup exams will be given unless (1) notice is given to the instructor, in person, by 5 p.m. the day before the exam, or (2) extenuating circumstances prevail for which documentation is available, in the form of an airline ticket receipt, funeral notice, etc. (in the case of family emergencies) or a doctor’s case note (not an appointment card) for SERIOUS illness/injury. This documentation MUST be presented to the instructor, not merely offered. All makeup exams must be taken within one week of the missed exam. There are no exceptions to this policy. Academic dishonesty: The University of Washington has a set of guidelines on how to respond to suspected cases of academic dishonesty, or "cheating." These cases include plagiarism in written assignments (copying directly from the text or another student’s work) and referring to contraband or getting help from someone else in testing situations. You should familiarize yourself with these guidelines. As a student at the University of Washington you are held to "high standards of academic and professional honesty and integrity" by the Student Conduct Code. The Student Conduct Code can be read on the University’s homepage at www.washington.edu/ students/handbook/conduct.html. If academic dishonesty occurs, you will receive a grade of zero on that assignment or exam. I will refer the matter to the Dean of Arts and Sciences.